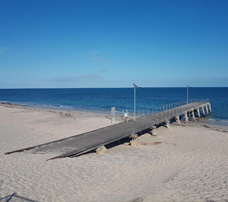 Jetty Caravan Park is a "little gem" located in Normanville on the Fleurieu Peninsula, South Australia, and just 75 km south of Adelaide's GPO. 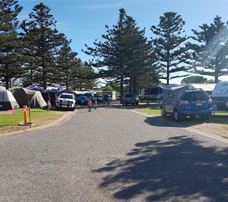 The Southern Expressway and major roads make it a short trip to Normanville and our park. 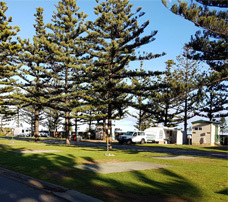 The Caravan Park is on the beach and an easy 10 minutes walk to the town centre. From here it is 30 minutes drive to Cape Jervis and the Kangaroo Island Ferry, Victor Harbor and the McLaren Vale wine region. The park offers the traveller a variety of accommodation from 1 and 2 Bedroom Ensuite Cabins, to Budget Accommodation catering for small groups to backpackers. Caravan and camping sites are located amongst sandhills and trees offering protection from the elements. There is an open plan camp kitchen with TV, a huge open fire to gather around on those wintry nights and a large dining area - making it a comfortable area to share with family and friends. Hosts Bev and Peter Daniell look forward to welcoming you.